Get ready for another global warming hoax campaign in 2015 designed to convince people that CO2 is the cause of global warming, and that humanity is in trouble unless we do something to control human behavior. When the money starts getting thrown around again and they start planning the concerts to make people feel good, remember they are mind-hunting for believers again. Just like a religious ceremony, the new 2015 global warming hoax events will call on believers to lay down their sins of "denial" and come to the lord Al Gore who was ahead of humanity decades ago when he figured all this out. Gore was not stopped by the fact that CO2 is a natural, necessary gas that makes life possible on earth. Not a chance. Gore postulated that CO2 was a "pollutant" and he convinced himself and the "scientific community" that somehow he was right. His personal agenda that has made him millions $$$, all incidental, was not intended to impede his message. Followers of the global warming religion and new converts alike were asked to ignore Al Gore himself and to ignore all historic temperature data and just focus on the "sea level" theory. They were asked to shut off all forms of reason and logic and follow, and that they did. Because of this politically motivated religion and occasional deep funding, the movement has literally died and come back to life many times. It has shown itself to be resistant to any and all data that exposes their movement as a fraud and has developed a type of short term memory that comes in handy for side-stepping strong arguments against it and historical data that blows their fraudulent theories wide open. Are you wondering by now why? Why does the global warming movement imitate Jason from Friday the 13th and continues coming back from the dead? Wonder why do these global warming theories get debunked only to come back for more? Are you aware that in 2013 emperor Obama actually took over "Climate change" legislation with a bizarre executive order as a way of ignoring anyone who opposes their private climate agenda? All of this global warming monkey business is about long term implementation of Agenda 21 which is the official implementation of the new world order. It's the actual "world order" that is "new" to us all. This is the reason the global warming hoax was created and this is the final goal. Implementation of Agenda 21 has been planned for many years and if you keep these two movements together you'll have a point of reference to avoid any future disorientation. Like the global warming religion, Agenda 21 is about putting the earth first. Earth before self, earth before god, earth before everything but government. It's about worshiping the earth first, then implementing Hegelian dialectic- Problem Reaction Solution. If the earth is broken they we need to fix it. If fixing it means controlling human behavior, then so be it. Government will see to it that the earth is taken care of. 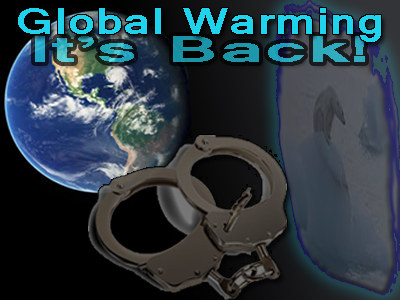 The global warming hoax and Agenda 21 is about the birth of a new form of "crime". Soon those who "violate" the earth will be subject to ... you guessed it, tax penalties and ... you guessed it, jail. With prisons now openly operating as FOR PROFIT slavery camps, it behooves the government to make up more and more laws that help put more people in jail. Remember- Jail = Slavery for profit $$. If you don't know this, let this article be your awakening. It's all about slavery and profit. The slave factories need bodies and the laws enforced GLOBALLY will ensure millions more will join the slave factories. Humanity is officially becoming one big slave camp. The new world order really is here. So stop wondering why this age-old outdated theory that blames the amazing and wonderful natural CO2 as the "terrorist" of gasses and labels it a "pollutant", came to be. Humanity had been warned for years to step back and see the greater picture but left wing climate changers we found out are immune to logic and reason and are wide open to sensation, music shows, images of melting ice, the same exact polar bear sitting on a small block of ice, and "deniers" propaganda. Don't bother mentioning to these religious folks about the 30,000+ scientists and researchers who long ago sued Al Gore for fraud. Don't bother explaining to these religious folks the history of the relationship between CO2 and temperature, and that CO2 follows temperature not the other way around. Don't even bother reminding these religious followers of the global warming movement that in 2009 (and again in 2011) their movement ended when top IPCC scientists were caught lying about the global temperature data to "hide the decline" in temperature in the now famous Climategate scandal. Instead of spending your energy on these people, realize that this agenda is here to stay and it's your individual freedom at stake not some silly debate about CO2 as they would have you think. Your individual freedom is up for debate at your local level of government where Agenda 21 zombies are heavy at work and your energies may be better spent here. For now, realize that global warming = new world order, and Agenda 21 = new world order, which all equals your permanent enslavement. Don't expect the global warming movement to even mention the fact that geoengineering is ongoing, is illegal, and is changing our weather and ecology dramatically and permanently. Don't be surprised that one of the leading geoengineering voices himself is selling the global warming hoax straight to everyone's face claiming that mainstream media is actually hiding global warming with global cooling stories! This enslavement was planned long ago and all of us will have to come up with new ideas for resistance and mass public awareness of the overall agenda. Till then, this back and forth climate battle attempting to sell the idea to the minds of those who are naive enough to believe it will continue as long as the new world order plans are ongoing. Ask yourself, what are you doing to head off this mass deception coming in 2015. Do you care? Do you see the bigger picture?